Continuing on his European exploration, Michael Portillo provides an insight into "Great Continental Railway Journeys" in this enticing programmme. This five episode series is being shown on Thursday evenings at 9pm on BBC 2 and BBC HD. Michael begins this journey in Berlin, the capital of Germany, which at the beginning of the 20th century was a powerhouse of science and technology. Led by his 1913 railway guide, he then heads west via the picturesque Harz Mountains to the industrial Ruhr Valley to learn how imperial Germany was war ready. He then travels south along the tourist trail of the castle-studded Rhein river and ends his journey in the Rheingau to taste the wines of its age old vineyards. Ffestiniog Travel's comprehensive European ticketing service allows you to follow in Michael Portillo’s footsteps. Begin your journey by travelling from Berlin to Wernigerode, and allow a few days to explore the "Harzer Schmalspurbahen" (HSB) in the Harz Mountains. Then travel onwards to Wuppertal for a ride or two on the famous Schwebebahn suspension railway hanging from it's rails. 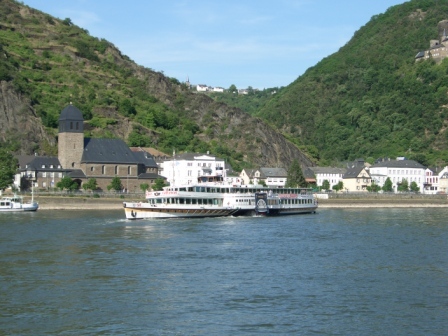 End your journey in style by travelling along the banks of the Rhine (Rhein in German), one of our favourite scenic routes, and on to Erbach. Fares start from £165.00 for a single journey in second class including a three day ticket for the HSB and a Länderticket valid on the Wuppertal Schwebebahn.